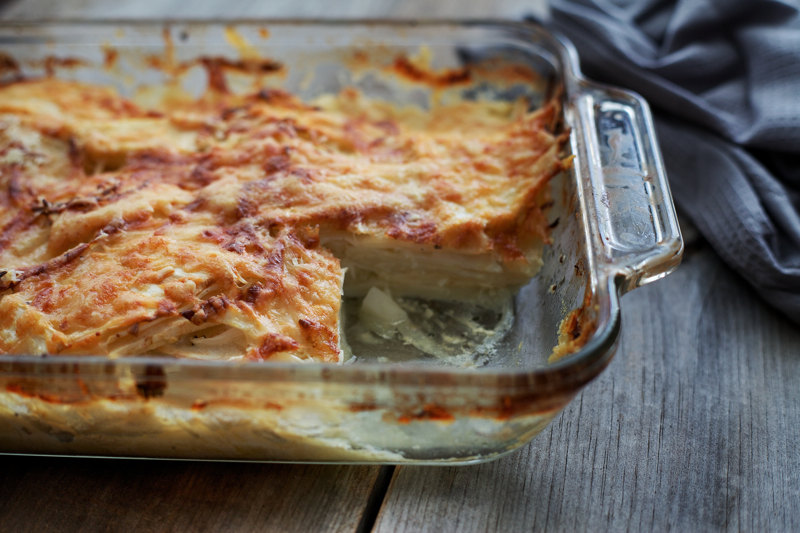 This celery root and onion gratin recipe delivers on flavour. 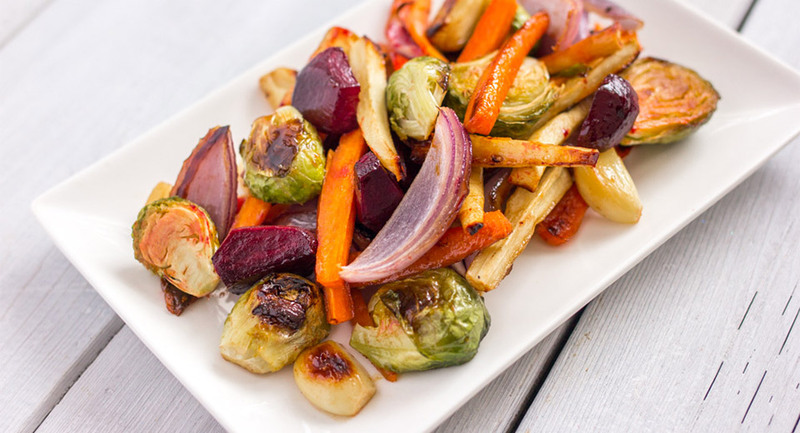 It’s a decadent side dish that smells delicious and comforting as it bakes. 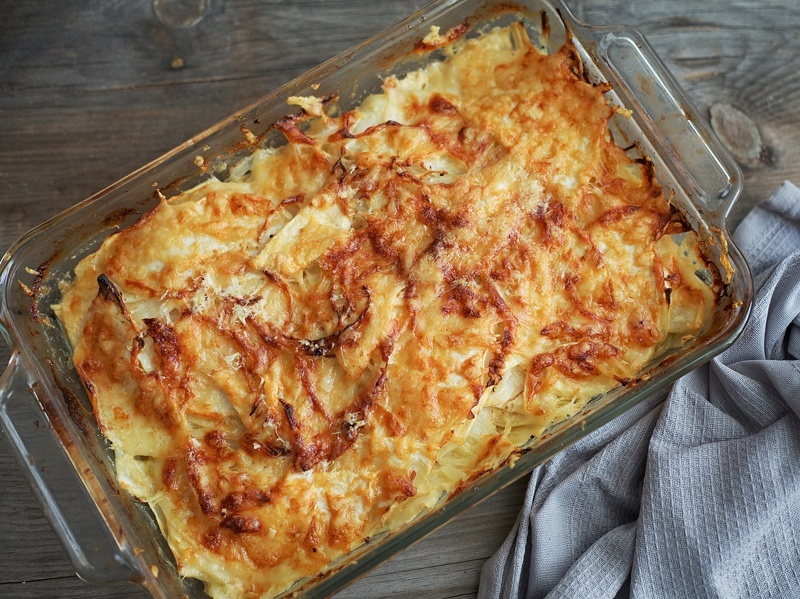 Besides slicing the celery root, this recipe requires little effort – just mix all the ingredients together, tip into a buttered baking dish, top with Gruyere cheese, and bake. 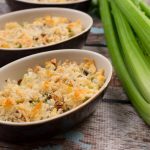 The onion adds to the slight sweetness of the celery root, while the Gruyere adds to its nuttiness. Butter 11 x 7-inch glass baking dish. Mix together celery root, onion, garlic, salt, pepper, and whipping cream in a large bowl. 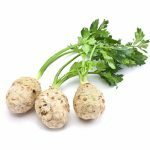 Pour celery root mixture into baking dish; and spread to an even thickness and gently press to compact. Sprinkle with cheese. Bake until top is golden brown, about 60 minutes. Allow to rest for 10 minutes before serving. It’s very important to let it rest after it comes out of the oven. Cooling slightly will allow the cream to finish thickening. It’s easier to mix the celery root and onion mixture with your hands. This will make sure the cream and garlic spread evenly throughout the onions and celery root. A pinch of thyme or rosemary would be a nice addition to this recipe. Try adding cooked ham or bacon to the mix. Because it’s so rich, it would go well with something green such as a salad tossed in a simple vinaigrette or steamed broccoli. Take your time slicing the celery root. A sharp knife and patience will make cutting it a breeze. A mandolin and a slicing wheel on a food processor is a sure way to slice the onion and celery root quickly. Remember, you must use whipping cream (35% cream). If you use a lower fat cream, it will curdle.